Former Conservative government appointee Mark Jaccard used a keynote speech at a Washington event on Monday to trample Canadian authorities' message on oil pipelines while describing the country as an environmental "rogue state." A former Harper government appointee used a keynote speech at a Washington event on Monday to trample Canadian authorities' message on oil pipelines while describing the country as an environmental "rogue state." Mark Jaccard was one of the first people nominated by the Conservatives to the environmental file, when he was named in 2006 to the federal government's now-defunct National Round Table on the Environment and the Economy. The environmental economist delivered a lengthy rebuke of Canada's climate-change performance at the event near the White House, as the Obama administration continued to grapple with whether to approve the Alberta-U.S. pipeline. Jaccard, an adviser to different governments and a professor at Simon Fraser University, said he doesn't want the oilsands shut down — he just doesn't want them to grow. That message stands in sharp contrast to that of the Canadian government, which has spent millions to publicize the benefits of oil development through different means such as posters in the Washington, D.C., subway system. "On climate, Canada is a rogue state," Jaccard said. "It's accelerating the global tragedy ... The U.S. government should reject Keystone XL and explain to the Canadian government that it hopes to join with Canada (on a global climate plan)." Jaccard was the headline speaker at a summit tied to a well-connected Democratic donor, the so-called "green billionaire" Tom Steyer, and attended by a number of U.S. media outlets. Greenhouse-gas emissions need to drop 50 to 75 per cent by 2050 to limit temperature growth to a 2C target, Jaccard said. Such an achievement would be inconceivable with a growing oilpatch. The event, and the choice of location, were designed to arm-twist the Obama administration as it faces its Keystone dilemma. It was held in Georgetown, where President Barack Obama delivered a speech in June saying Keystone would not be approved if it significantly increases greenhouse-gas emissions. The title of the event was, "Can Keystone Pass The President's Climate Test?" One speaker after another suggested that, no, Keystone cannot be approved without a significant increase in carbon pollution as a result. Steyer opened the event with a speech that described Keystone as a logical investment for the oil industry. In fact, he called it vital. The longtime asset manager said the cheap, easy transmission would drive up the value of Canadian oil and lead to exponential growth in the development of the oilpatch. Which is why he wants it stopped. "(Keystone) is a literal and a figurative line in the sands," Steyer said. 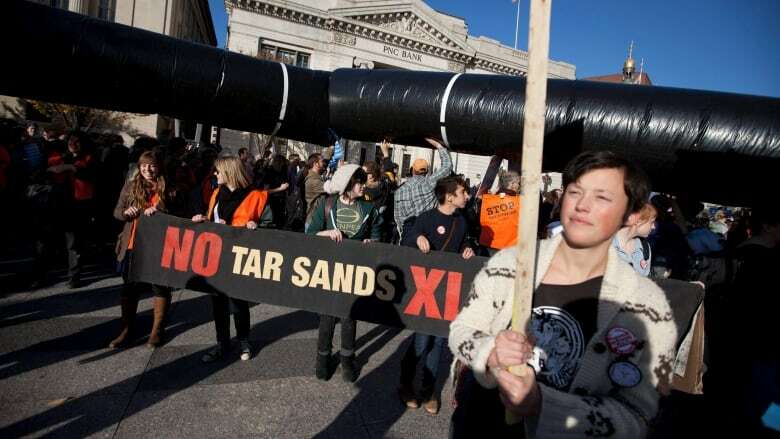 "Keystone is the economic key to unlocking the tarsands and, as such, it fails the president's test." He said getting oil to Gulf Coast refineries, cheaply, would be a great deal for oil investors. It would be a great deal for Alberta taxpayers and Chinese state-owned oil companies, he said. But it would be a bad deal for most everyone else, he said, starting with the American people. The other side of the Keystone debate was not represented at the event. The head of TransCanada Corp. and the Canadian ambassador to the U.S. were invited just a few days before the long-planned gathering, and both declined the invitation. Canadian envoy Gary Doer said he wanted to be there to make the case for the project, but already had plans to be in Canada. TransCanada boss Russ Girling, on the other hand, let it be known that he had no desire to attend an event he derided as "grandstanding" by Steyer as he seeks to build a political profile.